Posted this week are pictures from our construction and restoration of the fairway bunkers on the 7th hole. Please enjoy and hope you have a wonderful weekend! 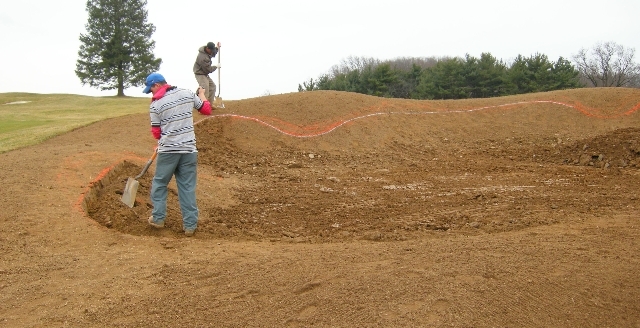 Below are 2 McDonald & Sons employees cutting the bunker edge on the upper bunker on the right-hand side of the hole. The bunker edge lines are painted in orange and white and weredrawn byGolf Course Architect, Andrew Green of McDonald Design Group. Below is a close-up of the bunker edges of the upper bunkers on the right. Anotherclose-up shot of the upper rightbunker edging. 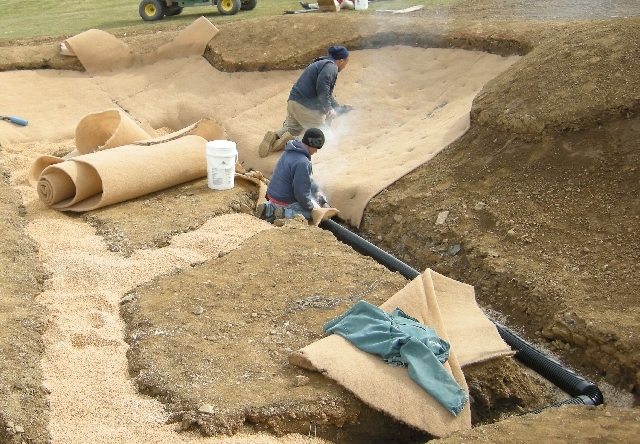 Below is the left-hand side fairway bunker and pictured (from top to bottom) are seasonal employees Nick Buoni and Mike Jones installing bunker erosion matting. 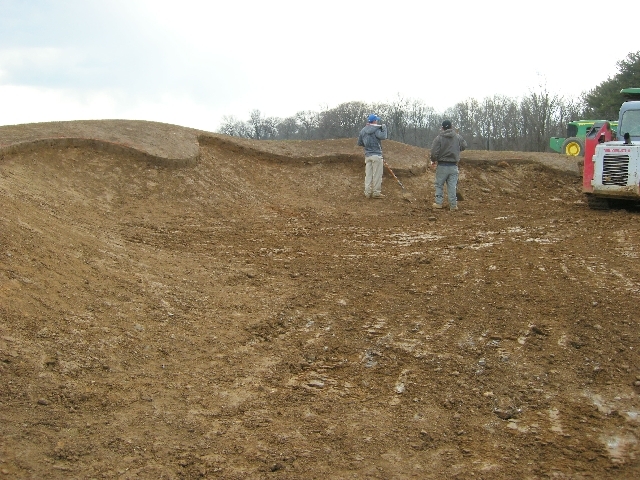 The erosion blanket will adhere the sand to the slopes of the bunker floor and prevent wash-outs during heavy rain events. 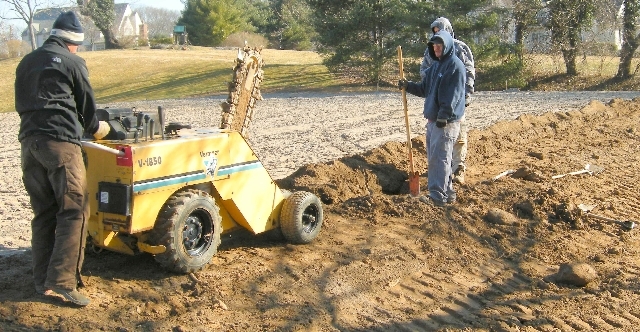 This prevents the new bunker sand from soil contamination. Also, you see 4 inch drain pipes are in the process of being installed as well. 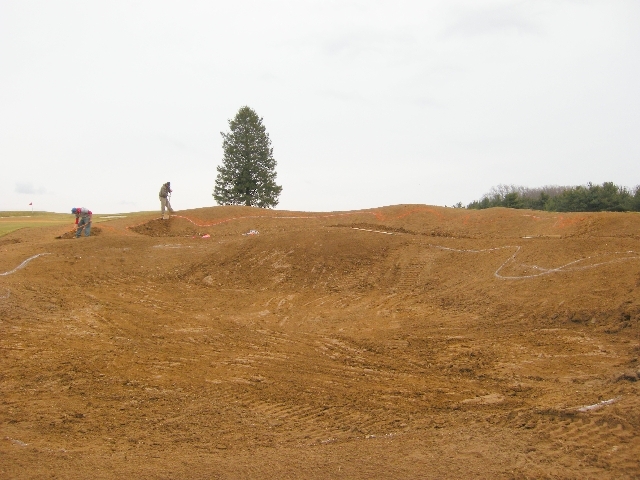 Below is the lower bunker on the right with erosion matting, drain pipe and pea gravel installed for drainage. 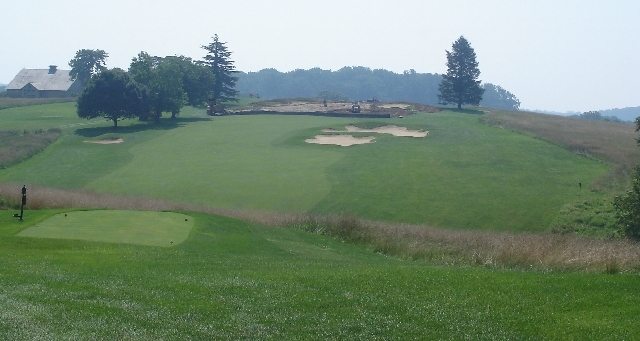 Below is a picture of the 7th hole while the green was under renovations in 2006. 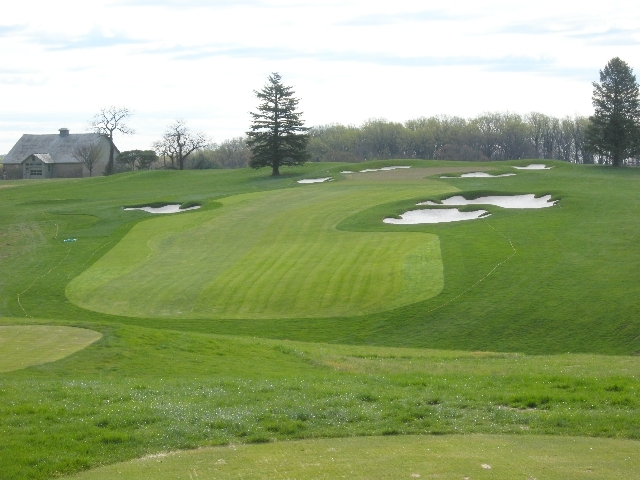 Below is a present-day picture of the 7th hole. 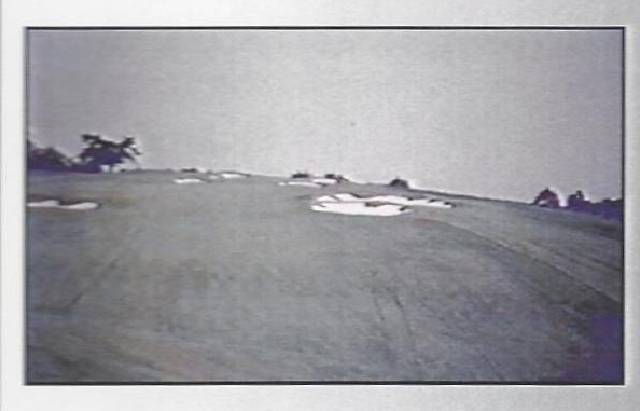 Below is a picture from the original hole in 1965. Welcome to the Golf Course GroundsBlog! Checkhere regularly for updates and pictures detailing thecare of the course by your Maintenance Team. 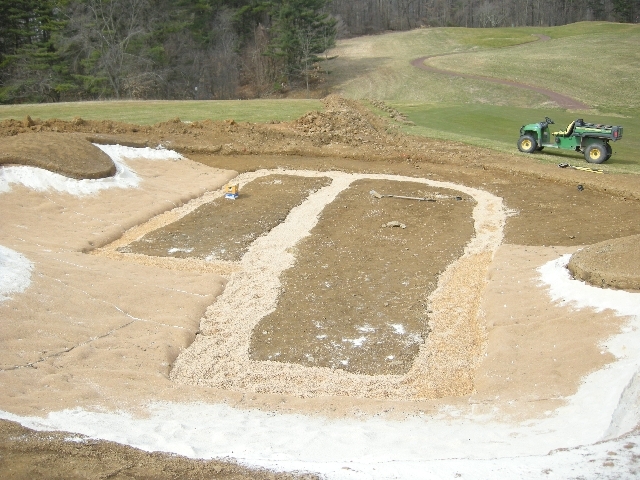 The pictures below depict our Practice Tee project this winter. 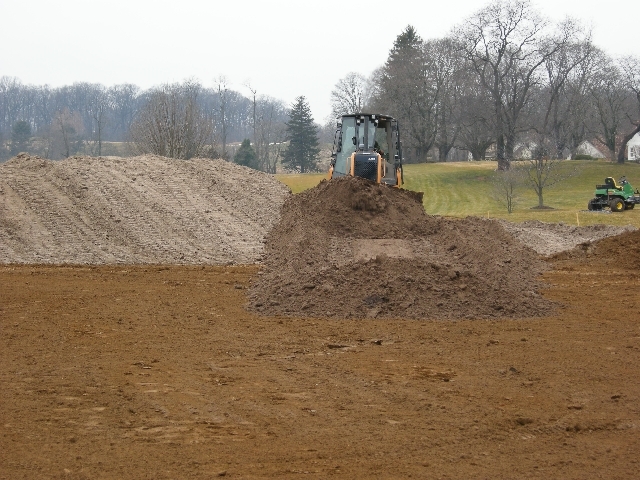 Pictured above is a bull dozer pushing the sand mix to one side of the teeing ground, preparing to re-grade the sub base. Pictured below is the exposed sub-grade. Our staffcreated a “shell” for thesand/ soil mix to be placed backnext to the native soil surrounds. 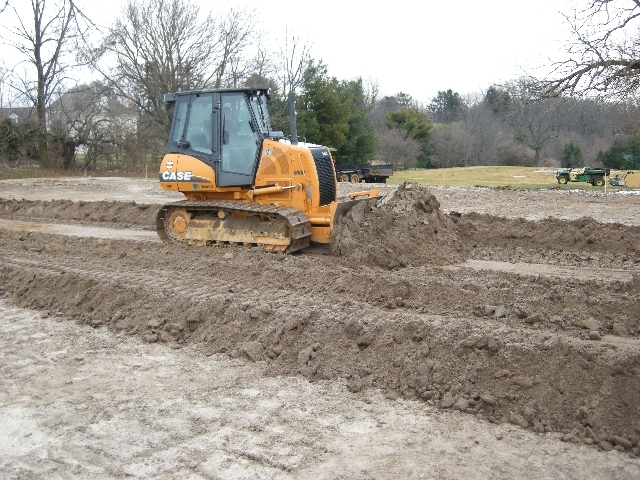 Below is the dozer placing the sand/ soil mix back on the right-side of the tee after re-leveling the sub-grade for a pitch 1 %, back to front. 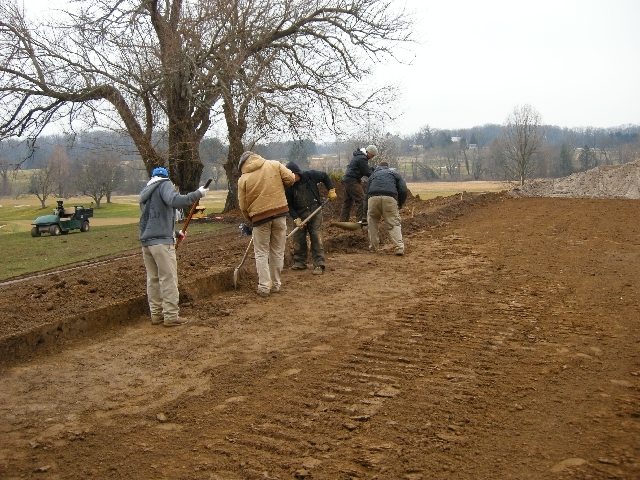 Our staff is preparing to install the irrigation for the tee. Pictured here (L to R) is Bill Hierman, Assistant Superintendent, and Mike Wallace, Seasonal Team Member. 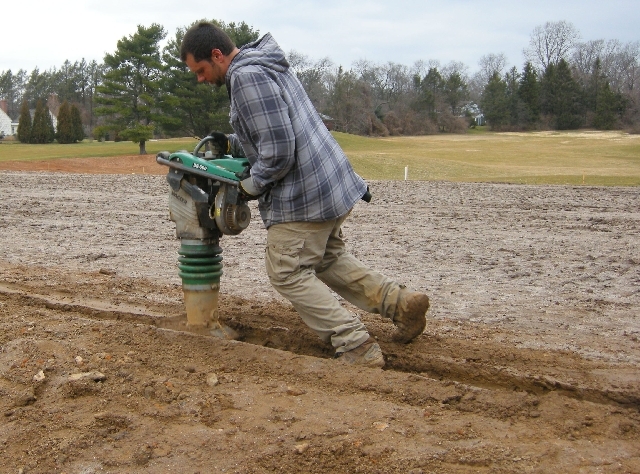 Below is Robert Luff, Seasonal Team Member, tamping the installed irrigation lines. 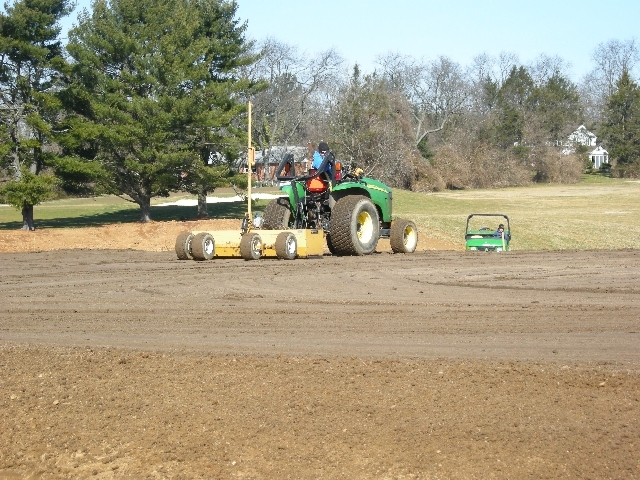 McDonald & Sons employee, Kyle Traskos, operating a tractor-mounted laser level to achieve our pitch on the tee surface of 1 % from back to front. 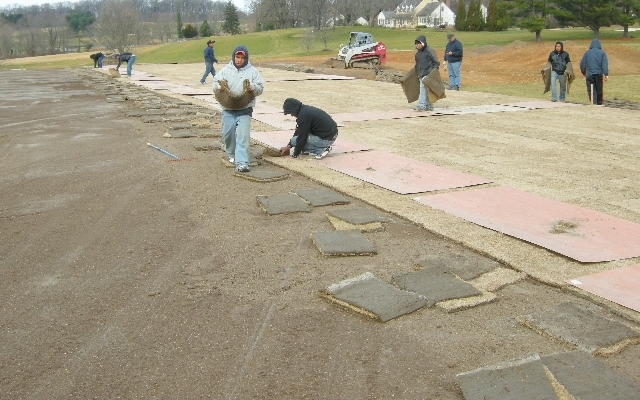 Below the dormant Bermuda sod is installed on Friday, March 9th. Below is the tee sodded with cold-tolerant Bermuda grass. The culitvar or trade name is Latitude 36 and was developed at Oklahoma State University. The front half is dormant while the back half was over-seeded with ryegrass. The tee surrounds were sodded to tall fescue. 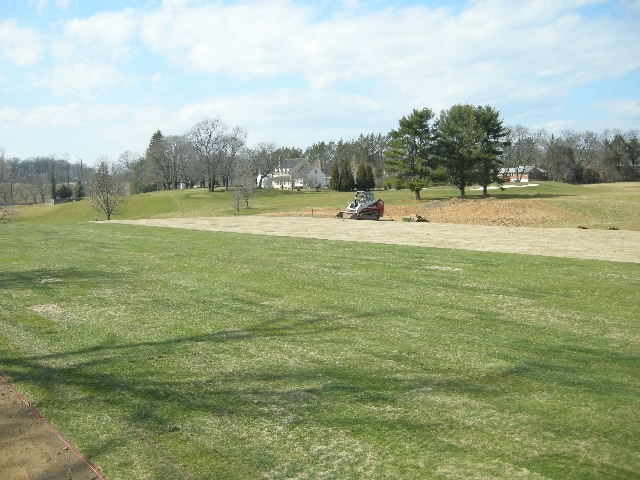 The area on the front left of the tee (near skid loader) will be seeded in April.